Opus Virtual Offices, has created this Privacy Statement in order to demonstrate our commitment to privacy. The following discloses our information gathering and dissemination practices for Opus Virtual Offices, Web site. As this Statement may be revised from time to time, please check back periodically. Opus Virtual Offices, may, on occasion, be required by legal authority to disclose your personal information to third parties or when we believe the disclosure is necessary to identify, contact or take action against anyone causing injury to you, Opus Virtual Offices, or the general public. Opus Virtual Offices, will use reasonable efforts to limit such disclosures to only what is required. By preserving our right to make disclosures in such instances Opus Virtual Offices, is not undertaking an obligation to defend you or others from injury or to seek relief for those injuries. Opus Virtual Offices, Web site may provide a request form for visitors to provide feedback or request additional information relating to Opus Virtual Offices, Inc’s services. This request form may ask visitors for contact information, such as the visitor’s name, address, telephone number and/or email address. Opus Virtual Offices, uses information submitted via the information request form to contact Web site visitors regarding the types of services Opus Virtual Offices, offers, and to demonstrate to the Web site visitors how they can benefit from Opus Virtual Offices, Inc’s services. 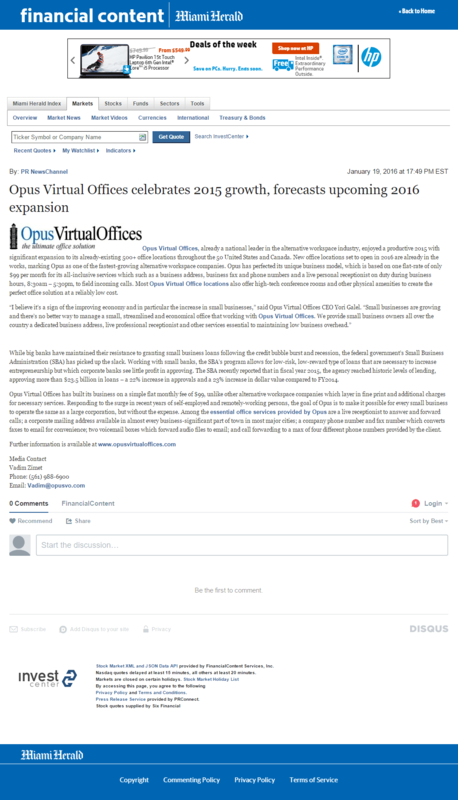 Opus Virtual Offices, may also use the contact information to contact Web site visitors when necessary. Visitors may opt out of receiving promotional information from Opus Virtual Offices, by not submitting an information request form. Opus Virtual Offices, will not sell or otherwise provide a visitor’s personal contact information to other companies, except prospective employers, without the visitor’s permission. Unlike user-entered data (such as form submissions) some types of personally identifiable information transmitted across the Internet are not readily perceptible to Web site users. Such information may include your Internet protocol address (“IP address”), which identifies your specific computer on the Internet, and personally identifiable information stored in session variables, or “cookies” on your computer’s hard drive. Opus Virtual Offices, may collect and use these types of hidden information on its Web site. Opus Virtual Offices, may utilize Logging IP addresses. 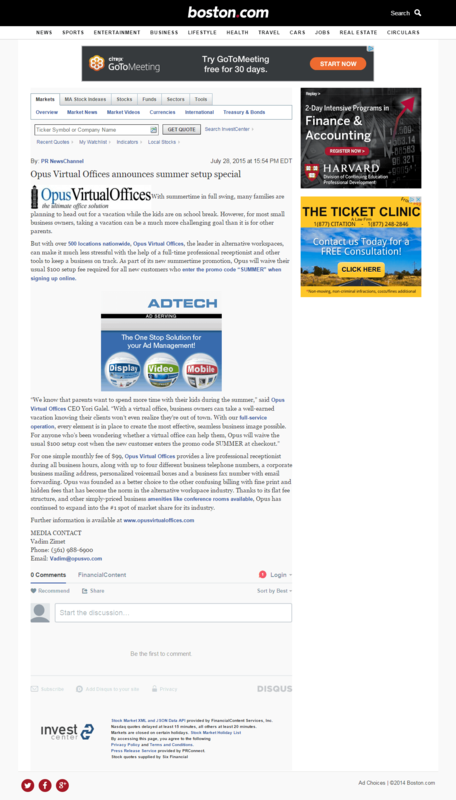 The Opus Virtual Offices, Web site may include links to and/or advertisements by other companies or Web sites. These other entities may collect personal information, including identification information from you. Please be advised that Opus Virtual Offices, is not responsible for the privacy practices or the content of such Web sites and this privacy statement does not cover the information practices of such sites. 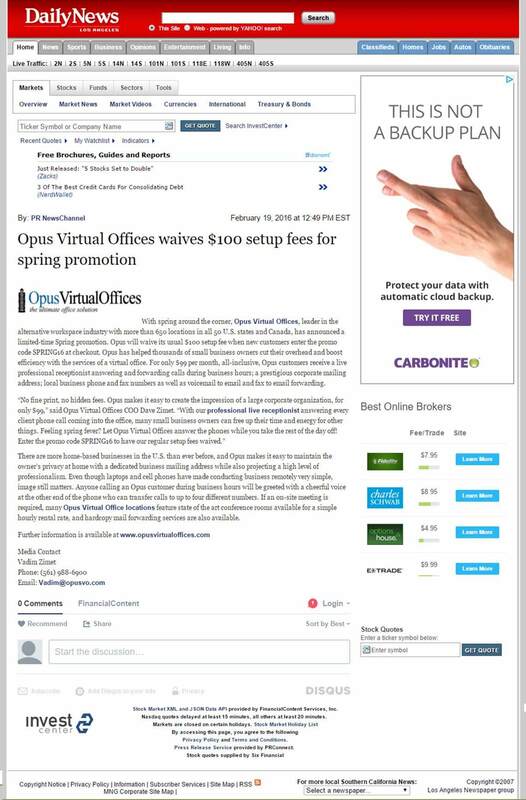 Opus Virtual Offices, does not receive any personal information about visitors to the Opus Virtual Offices, Web site from any third party, including any information collected by or through links to third party Web sites and/or advertisements on the Opus Virtual Offices, Web site. While Opus Virtual Offices, strives to protect its user’s personal information and privacy, no data transmission over the Internet can be guaranteed to be 100% secure. As a result, while Opus, stores your personal information in data networks that are password protected, we cannot ensure or warrant the security of any information you transmit to or receive from us through our Web site and online services. If you have any questions about this privacy statement, the practices of Opus Virtual Offices, Web site, or your dealings with Opus Virtual Offices, Web site, you can contact info@OpusVO.com, or call Opus Virtual Offices, at the numbers mentioned in “Contact Us” section.